Here is another one of our great great pre made holiday packages in Phuket, check out our Cheap 3 day 2 night holiday package Phuket no.2. We have many different package versions for Phuket and other cities in Thailand and we can customise any package according to your requirements. Like all of our other packages this Cheap 3 day 2 night holiday package in Phuket includes round trip airport transfers, followed by checking in to your 3 Star Hotel where you can freshen up and get ready for the evening when you will be picked up and taken to a wonderful Show and dinner at the famous Siam Niramit. After the show you will be transferred back to your hotel. On Day 2 you have an early start and then meet your transfer in your hotel lobby and be taken to a private Pier where you will be briefed for the day by your guide and board your big boat for your amazing day trip to James Bond Island and Phang Nga Bay for some sight seeing, canoeing and an amazing day out on the water. Finally on Day 3 you can enjoy breakfast at your hotel and get ready to be picked up for your transfer to the airport. Pick up at Phuket International Air port – Hotel – Siam Niramit + Show + Dinner + Transfer. – Our staff will waiting you at Phuket airport and transfer you to hotel by private car. Check in, And relax at your leisure time. – Be ready for the pick up of “Siam Niramit” at 17.00 pm. Enjoy show and dinner. One Day Trip Phang-Nga Bay “James Bond Island” by Premium big boat. – Morning breakfast at hotel. 07.30-08.00 am. Pick-up from your Hotel. 08.30-09.00 am. 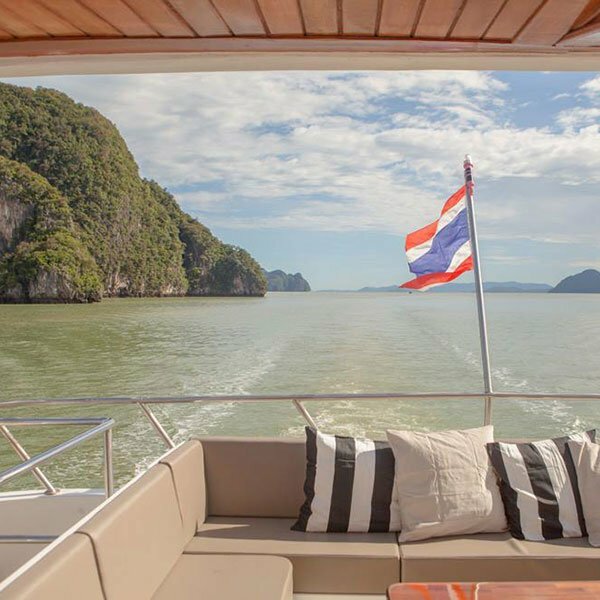 Arrive at our private pier, Where our journey to Phang Nga Bay and James Bond Island will start from. 09.00 am. Meet your guide. 11.00 am. Visit the James Bond Island, Where the movie starring Roger Moore “Man with the Golden Gun” was shot in 1974. 12.00 am. Buffet lunch on the boat while the boat will pass the surrealistic limestone mountains, one of the unforgettable natural wonders in asia, with its huge and all covered in green of trees, plants and rocks towering vertically out of sea water. 13.00 pm. Canoeing at the Hong Island which is one of the famous canoe sites in Phang Nga. Hong in Thai language means room and here at koh hong big and small limestone mountains which give you a feeling of being surrounded in a large hall with two doors. 14.00 pm. Swimming and Relaxing. 15.30 pm. Arrive at Klong Khien Pier. 15.45 pm. Visit the Samet Nangshe View Point, the best place to see the breathtaking view of Phang Nga Bay, and you can take as many pictures of you as you wish. Our friendly and caring staff will help you to take the best shots in your collection. 17.00 am. Arrive to the pier and transfer back to your hotel. Pick up from Hotel – Transfer to Phuket Airport. – Check out, and Be ready for the pick up of hotel and transfer to Phuket Airport by private car. 2 Nights accommodation in Phuket with daily breakfast. Siam niramit Show + Dinner + Transfer round trip. 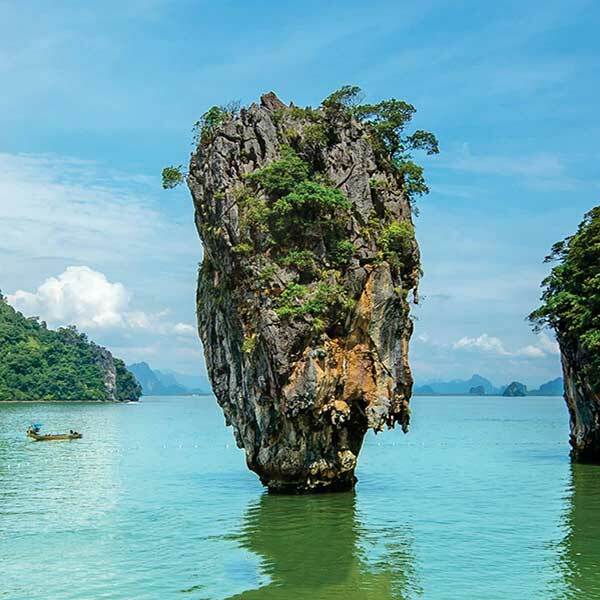 One day trip Phang-Nga Bay by bigboat + Lunch + Include National park fee. 2 Breakfast, 1 Lunch, 1 Dinner. This is another great cheap 3 day 2 night holiday package Phuket no.3. Airport transfers, Hotel, breakfast, Phi Phi island trip & Private Phuket City tour. Starting with our basic pricing you can choose to upgrade this package according to your budget and your holiday requirements, check out the details below and talk to us about making you a custom holiday package in Phuket. This is a 5 Star Cheap 3 day 2 night holiday package Phuket no.4. 5 Star Hotel, Breakfast, airport transfers, Maiton island speed boat trip and zip line adventure tour included. A very fun holiday. Check it out and let us know what you think.